A collaboration between the SPA, Child Poverty Action Group (CPAG) and the Journal of Poverty and Justice, this policy roundtable was timed coincide with the launch of a special issue of the latter on ‘Exploring ‘welfare’ attitudes and experiences’. The roundtable, which took place at the House of Lords, was chaired by Baroness Lister of Burtersett (also wearing two further hats as SPA President and member of the Journal of Poverty and Social Justice editorial board) and Alison Garnham, Chief Executive of CPAG. The starting part for the discussion was a summary of the key messages and findings form the special issue, its guest editors – John Hudson (University of York), Ruth Patrick (University of Liverpool) and Emma Wincup (University of Leeds) – providing an overview. They were joined by two more contributors to the special issue – Neil Lunt (University of York) and Mark Monaghan (Loughborough University). Picture caption: sadly we cannot include the usual photograph of the SPA Policy Roundtable in full flow because the House of Lords does not permit the use of cameras inside the building! 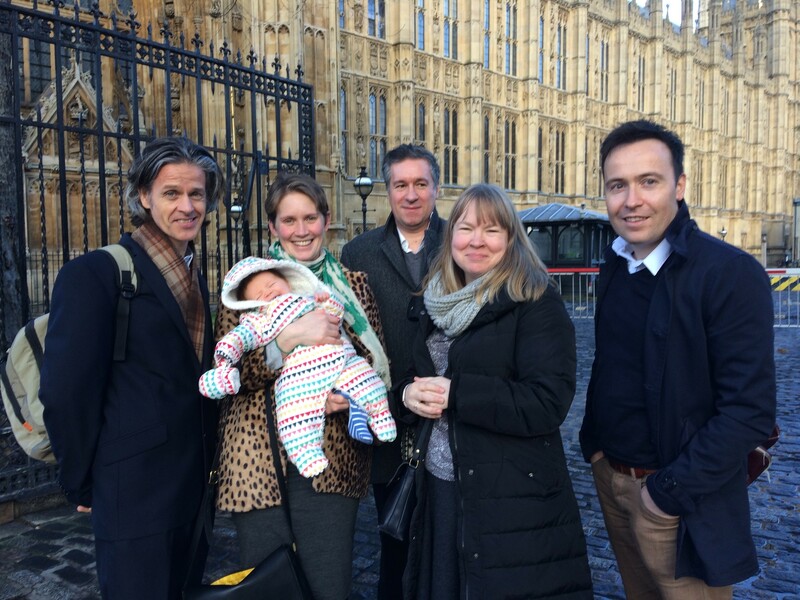 In its place here is a photograph of the roundtable speakers outside of Parliament: from L-R: Neil Lunt (University of York), Ruth Patrick (& baby Nina!, University of Liverpool), John Hudson (University of York), Emma Wincup (University of Leeds), Mark Monaghan (Loughborough University). A lively discussion followed, with many telling contributions from the invited expert audience. Particular thanks are due to Kelly Smith and Imran Hussain from CPAG for assembling such an outstanding a diverse audience; there was particularly strong representation from the third sector and think tanks, including Britain Thinks, the Children’s Society, the Equality Trust, Joseph Rowntree Foundation, the Living Wage Foundation, Shelter, the Westminster Policy Institute, as well as people working in Parliament, central and local government, and the media. Three themes stood out from the discussion. First, audience members made a number of suggestions for shifting attitudes which go beyond ‘mythbusting’ (which is subject to critical evaluation in the special issue in an article by Baumberg Geiger and Meuleman). These included using individual stories of negotiating social security system or using social media to engage with claimant groups. Linked to this the second theme was to focus on the human costs of reliance on social ‘security’ in its current form; for example, in terms of poor mental health and living in poverty, and increasingly destitution. The final one was moving away from making the case for social security to focus on the reasons why individuals may become reliant on it (for example, significant numbers of people engaged in low paid, precarious work or underlying stigma to groups at high risk of worklessness such as drug users).